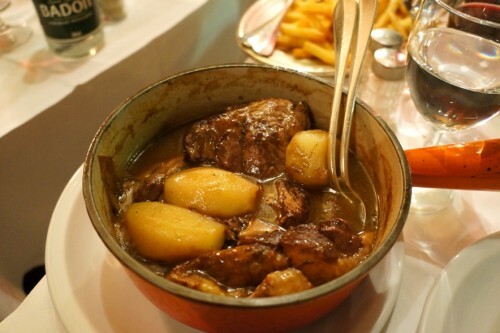 While doing some research on the best coq au vins in Paris, A la Biche au Bois came up many times. 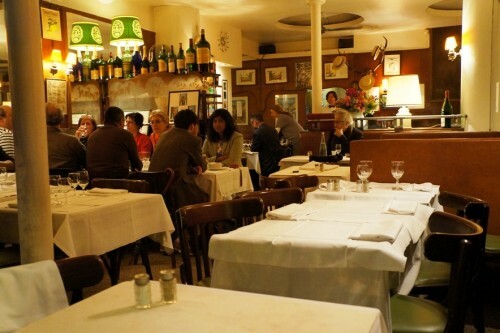 Located in the 12th arrondissement near Gare de Lyon, the restaurant was packed full of locals. You’ll notice that the servers here are quite sarcastic (not that we minded). We were running a little late and our table was given away to a tourist travelling by herself. She told the server she didn’t speak any French and only spoke a bit of English. She had trouble reading the menu and requested a plate of chicken and a side of rice. The server responded “No rice. We are not a Chinese restaurant!” They went on for another minute or so and the last I heard was the server saying “if you don’t like it, you can just leave.” She immediately stood up and left. The server then turned to us and said “it’s your lucky day!” and seated us. 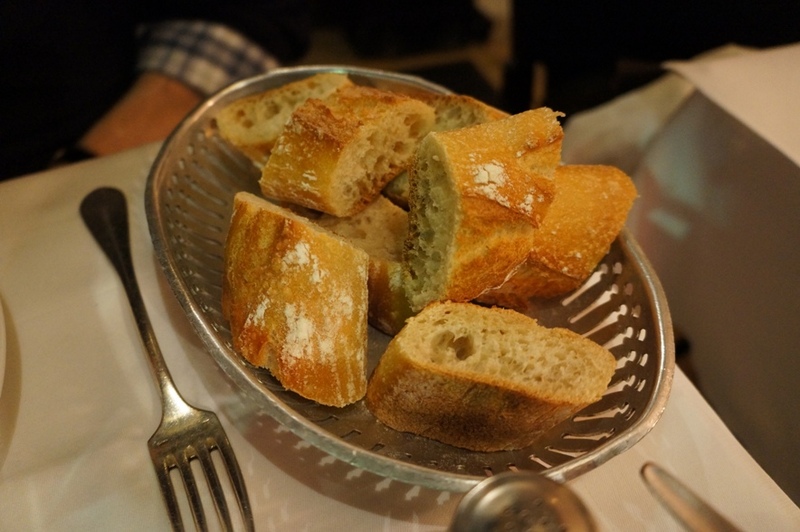 The restaurant serves classic French fare at reasonable prices. They’re known for serving fantastic game dishes but unfortunately we weren’t here during the right season. They offer a 4-course menu for 29.80€ which includes a starter, main, cheese and dessert. I guarantee you’ll leave stuffed! To start, I went with La Terrine de Canard et de Lapin (duck and rabbit terrine). As you can see, the portions here are quite generous. 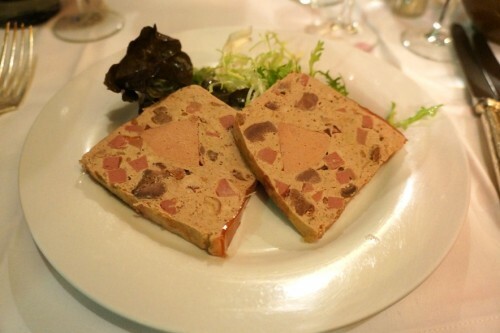 You get two slabs of the terrine! The terrine had a wonderful flavour and was a great way to start off the meal. 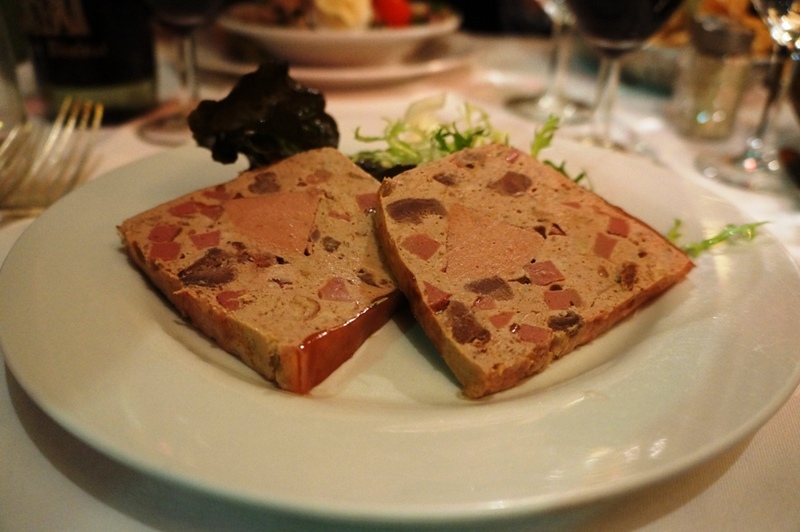 We ate a lot of terrines during our France trip and didn’t have one we didn’t enjoy. 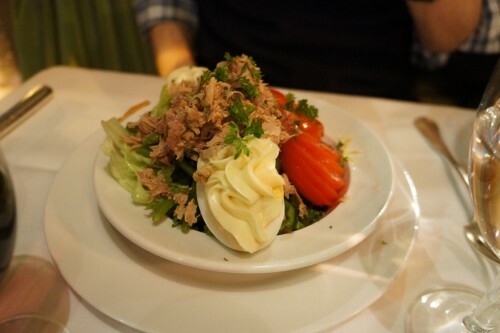 Mike went with something on the lighter side, La Salade Niçoise which consisted of shredded tuna, asparagus, eggs and tomatoes on a bed of lettuce. It may look simple but the fresh ingredients really packed a punch. I couldn’t help but steal more than a few bites off of Mike’s salad. A few minutes later, our server came by to bring over a platter of ingredients which and informed me I was supposed to make my own tartare. 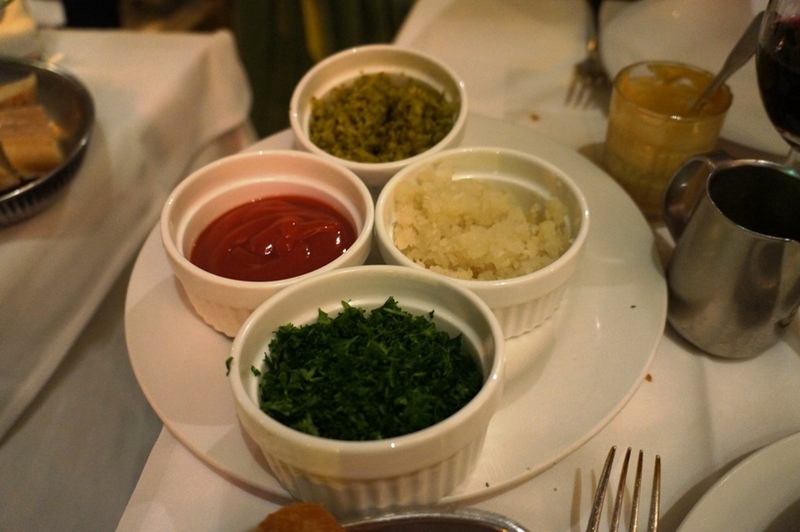 Uh oh…I’m used to going to a restaurant where the food is prepared for me. 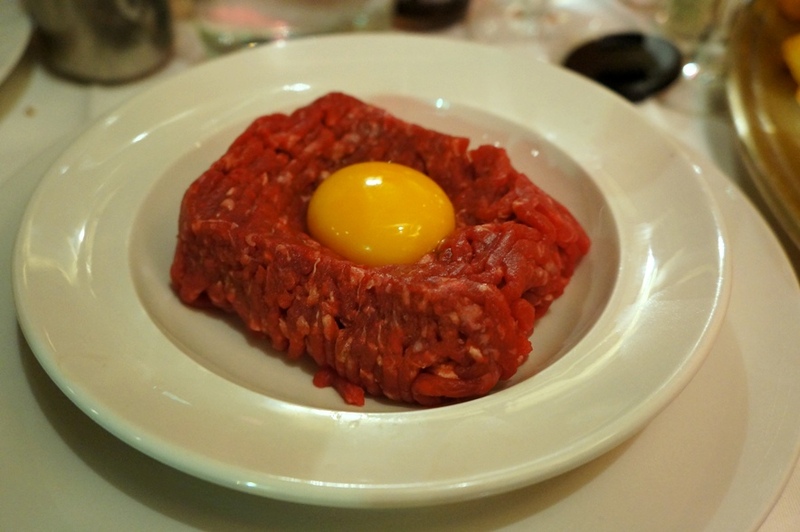 I’ve never made a tartare myself and was worried how much of each ingredient to use. 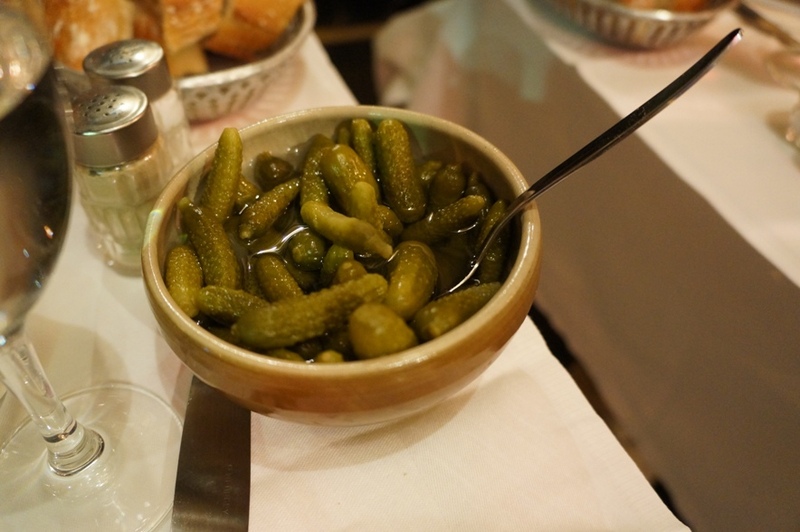 The selection of ingredients included pickles, parsley, onions, ketchup, worcestershire, mustard, oil and tabasco sauce. 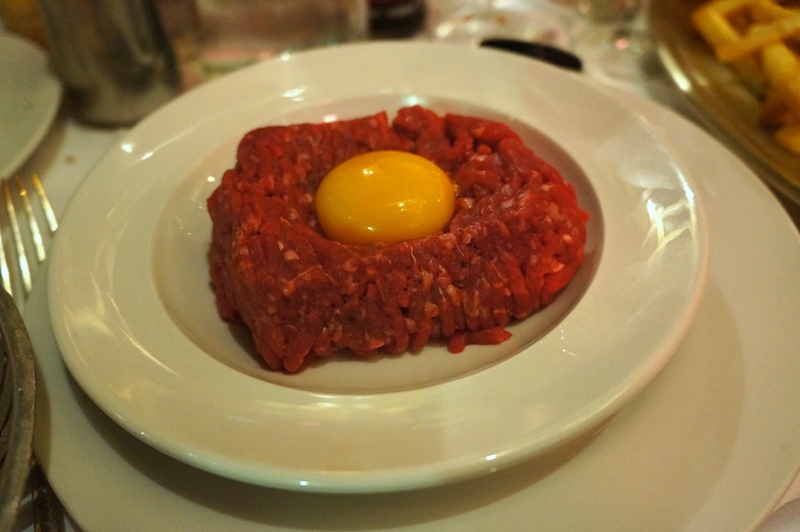 It took me a while but I eventually produced a palatable tartare! 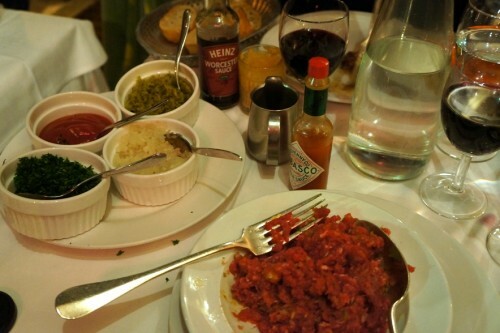 The steak tartare came with a large plate of fries which were fried to perfection. 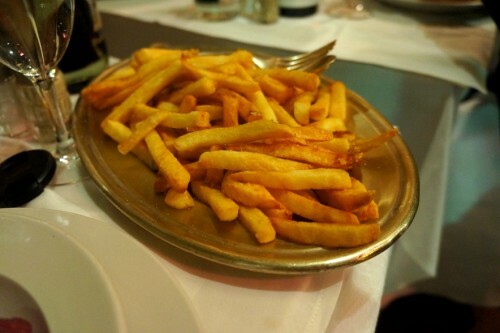 I knew that if my self-made tartare failed, I could always fill up on these delicious fries as a back-up. Thankfully, it didn’t come to this. Mike ordered Le Coq au Vin which was listed on their menu as their specialty. It arrived in a huge dark pot filled with large chunks of chicken, potatoes and a dark, rich sauce. The dish certainly lived up to all the hype – the meat was tender and the thick sauce was spot on. A must-order! 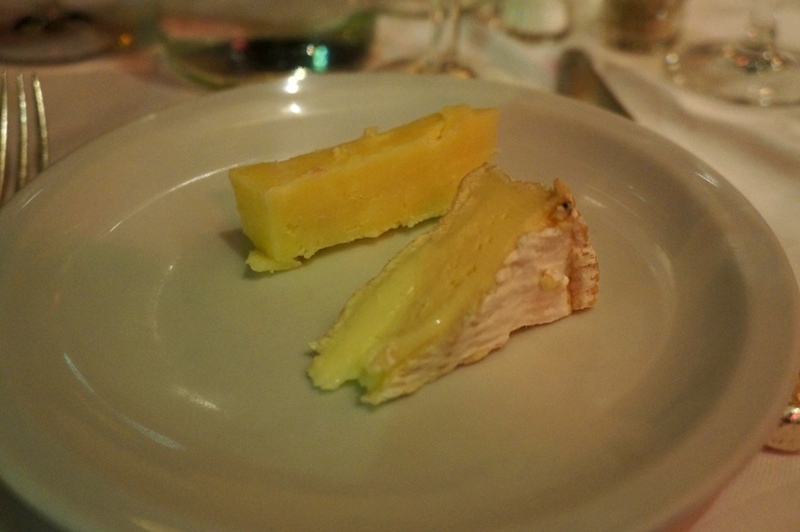 After our main courses, our server brought out a huge platter of cheese. He described each type of cheese to us and cut off a piece of whatever we pleased. 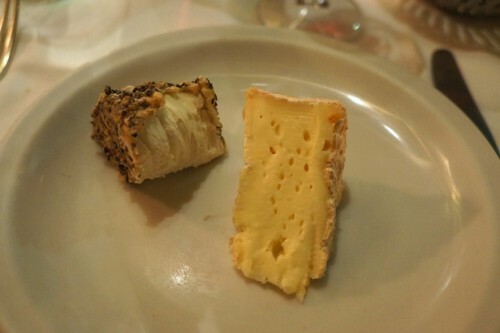 Between the two of us, we tried the brie, crusted goat cheese and a hard sheep’s milk cheese. 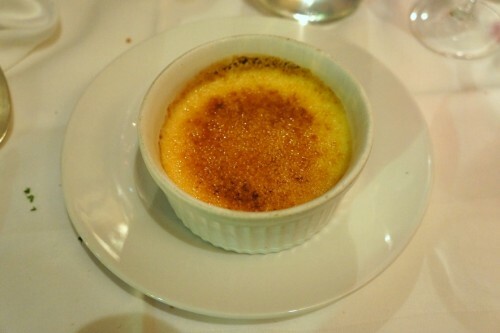 For dessert, my choice was La Crème Brûlée. 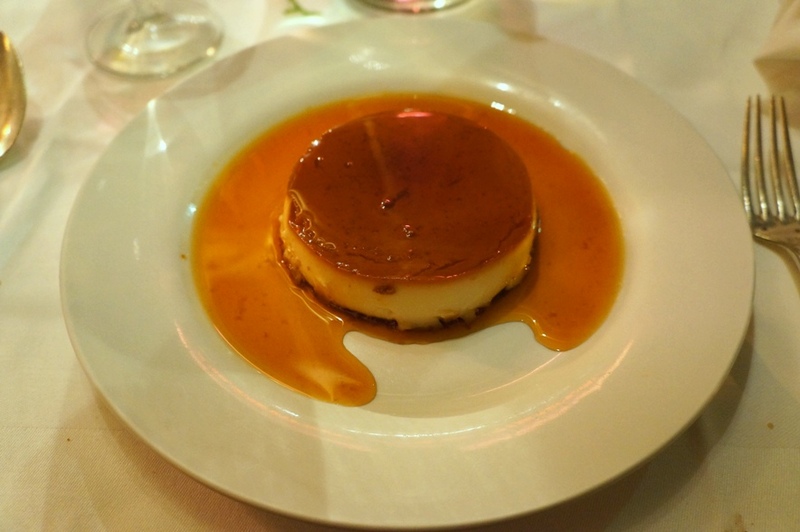 With a torched top and rich custardy centre, I had no complaints whatsoever about this tasty dessert. Mike’s choice was the Crème Caramel. With a silky texture and a taste similar to my crème brûlée, it was an equally delicious dessert. 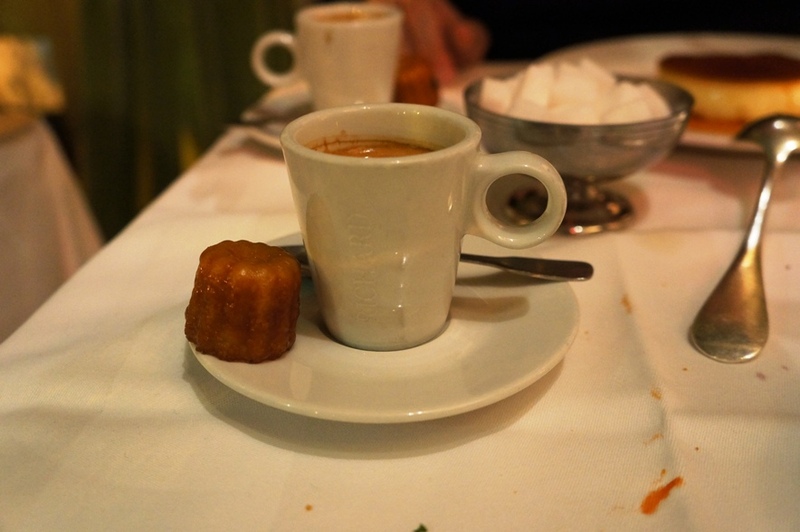 To complement our desserts, we ordered espressos which came with a small bite-sized canelé which was a nice touch. Overall, we had an enjoyable experience here. Sure, the tables are cramped together and you’ll have to tolerate the sarcastic servers (if that’s not your cup of tea), but their food really speaks for itself. And at 29.80€ for 4 courses, A La Biche au Bois is fantastic value by Paris standards!